Tim O’Brien is a longtime Houston-based music writer (who penned for the Houston Press and just completed a dissertation on Lightning Hopkins), community activist (who has spent years defending historic black neighborhoods and fighting for Fair Trade issues), and immense fan who has befriended countless people. Recently he has been undergoing intense treatment for Stage 4 cancer, which is dire. The system in which he finds himself is, of course, a mess, and getting treatment without health insurance is an immense battle. Hot Punk City has decided to step in and raise both funds and awareness in regards to his plight, which affects him, his wife, and adorable little girl. A few years ago, Tim raised thousands of dollars for punk icon Alejandro Escovedo by organizing a benefit featuring Joe Ely at the Continental Club. Just last month he did the same for heart surgery patient and punk pioneer Peter Case from the Nerves and Plimsouls at a club in Austin. Now, it’s our time to help him win the good fight. 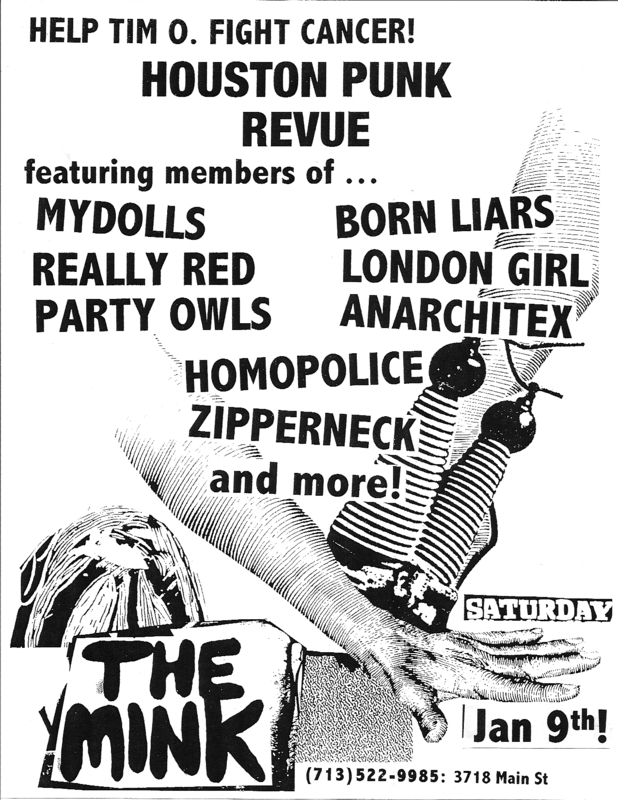 On Jan. 9th, an array of Houston rock’n’rollers, both past and present, will be featured in a Houston Punk Revue at the Mink. The Texas Biscuit Bombs, the former backing band of Randy Biscuit Turner of the Big Boys, who died due to a lack of proper medical treatment, will be the backing band playing host to the incredible icons who will be hitting the stage. Just like the soul shows of the 1960s, people will rotate on and off, playing a selection of songs that any audience should relish, from tunes like Really Red’s “Prostitution” and “I Refuse to Sing” to the Mydolls “Christmas Day,” Party Owl’s “Party Oi!” and Big Boys’ classics like “Fun Fun Fun.” And that is just the beginning! A punk garage sale will also happen, featuring hundreds of zines, T-shirts, CDs, albums, and more. All to aid Tim.